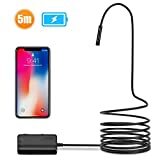 One of the most popular smartphone accessories we covered in all of 2018 was the DEPSTECH 1200P WiFi Borescope Inspection Camera. This awesome camera connects to any iPhone or Android device using a WiFi Direct connection, so there are no pesky cables or connectors to deal with. The camera can then be snaked into anything so your smartphone can see just about anywhere. There’s now a new and improved version of this awesome camera on Amazon, and it retails for almost $40. But if you use the limited-time coupon code MP3GXQJC at checkout, you’ll only pay $27.99.